Just as a sugary dollop of frosting can double the height of a cupcake, it turns out that today’s tallest skyscrapers are topped with useless space to inflate their height. 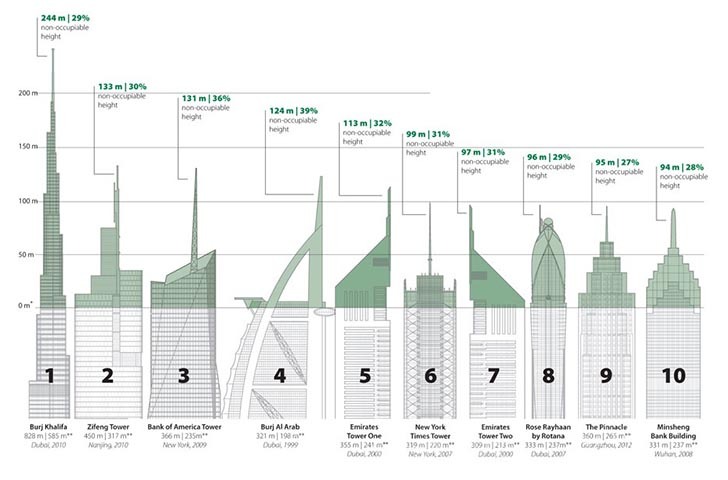 The Council on Tall Buildings and Urban Habitat (CTBUH) just released a report revealing the sheer amount of unnecessary “vanity space” added to the top of the world’s tallest buildings. The takeaway? Almost a third of the superstructures’ height is composed of useless space. The Burj Khalifa is the world’s tallest building at 2,716 feet – but it’s hardly exceptional without its 800-foot spire (which could be a skyscraper in its own right). The Ukraina Hotel in Moscow is the world’s vainest skyscraper, with 42% of the building’s 675 foot height being superfluous space. And among the “super tall” skyscrapers, or skyscrapers taller than 984 feet, the Burj Al-Arab in Dubai tops the list as vainest with 39% of its 1,053-foot height being unoccupiable. 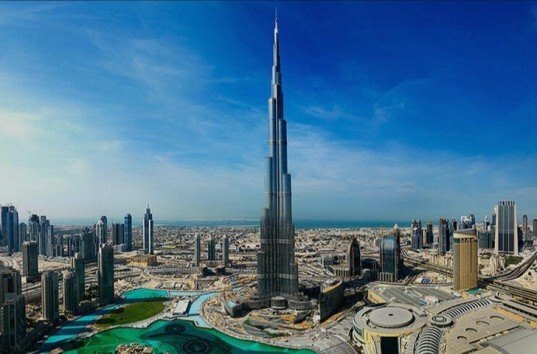 Not surprisingly, the United Arab Emirates holds the dubious distinction of having the highest number of vain skyscrapers, with an average of 19% vanity height across its tallest buildings. There's no rule about having to cram people into the rafters of any building let alone a super tall one. Air space isn't lit or heated, and probably contains plant and equipment. If anyone is to blame it's the Romans for putting a dome on the Santa Sophia. Rubbish inhabitat. Is this new? Or in Inhabitats case news??? Isn´t the Chrysler Building´s spire "vanity height", or the Empire State Building? Just above in "related posts" reads... http://inhabitat.com/spire-installed-on-one-world-trade-center-making-it-the-tallest-building-in-the-western-hemisphere/ So the 408 feet spire is what makes the building 1776 feet tal, not the building per se! Just as a sugary dollop of frosting can double the height of a cupcake, it turns out that today's tallest skyscrapers are topped with useless space to inflate their height. The Council on Tall Buildings and Urban Habitat (CTBUH) just released a report revealing the sheer amount of unnecessary "vanity space" added to the top of the world's tallest buildings. The takeaway? Almost a third of the superstructures' height is composed of useless space.